★Special Thanks to Naima Nasir. ★Special Thanks to ‘Fabienne Valmond’. Namhansansung Fortress is the base of Korea’s independence against the enemies. many Patriot warriors from their enemies who attacked Hanyang(The Previous name of Seoul). by Funday Korea Networks and Gyeonggi Province. 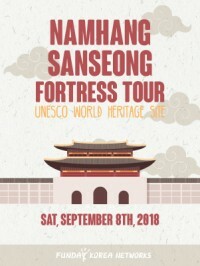 experience and then witnessed the grandiosity of NamhanSanseong by walking along the fortress. 남한산성 성벽을 걸으며 남한산성의 장려함을 직접 느껴보았습니다.